Today, we’re announcing two updates to our payments product: subscriptions and local currency pricing. Many developers successfully monetize their apps with one-time purchases of virtual items. Beginning in July, we are launching subscriptions as another way for you to build your businesses on Facebook. With subscriptions, you can establish a recurring revenue stream and offer updated content or premium experiences for a monthly fee. This new feature will be available to to all Facebook.com and mobile web apps in July. In the meantime, you can get started by reviewing our documentation and signing up for more details. Subscriptions are already being tested by developers such as KIXEYE and Zynga. 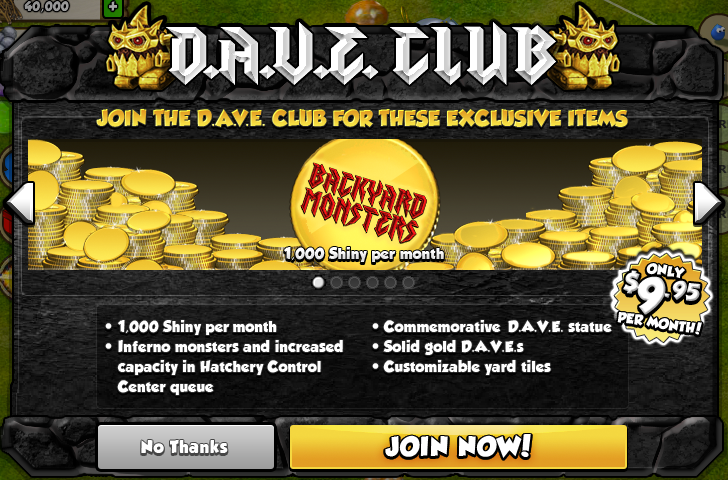 KIXEYE’s Backyard Monsters will start testing an offer of exclusive items for $9.95 per month. Since we introduced Credits in 2009, most games on Facebook have implemented their own virtual currencies, reducing the need for a platform-wide virtual currency. As a result, we are updating our payments product to support pricing in local currency (ex: US dollar, British pound and Japanese yen) instead of Credits. By supporting pricing in local currency, we hope to simplify the purchase experience, give you more flexibility, and make it easier to reach a global audience of Facebook users who want a way to pay for your apps and games in their local currency. With local pricing, you will be able to set more granular and consistent prices for non-US users and price the same item differently on a market-by-market basis. This transition will be seamless for your users on Facebook. Already, most people see items priced in their local currency in the payments flow. Additionally, we’ll convert any Credit balances into the equivalent amount of value in users’ local currency, which they can spend on in-app items in the same way they do today. People can still redeem gift cards and store unused balances in their account. Subscriptions already uses local currency pricing, and we will release local currency support for in-app payments in the next few months. Any apps or games that sell virtual items will be required to use local currency by the end of the year. You can find out more details by reading the FAQ and signing up for the latest information. Throughout these updates, our underlying payments product, along with support for global payment methods, and policies will remain the same. We hope new features like subscriptions and local currency pricing help you monetize more effectively and reach more users globally. We’ll continue to share updates in the developer blog.